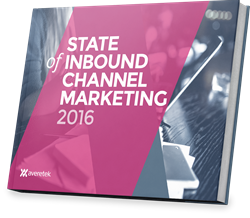 Averetek, (https://www.averetek.com), a global leader in channel marketing automation software and consulting services, today published the second annual State of Inbound Channel Marketing 2016 report. The report summarizes the 2015 activity by thousands of channel partners around the world as they leverage the marketing tactics, content, and marketing services offered by their brand partners through the Averetek software platform. The complimentary report is available at http://www.StateofInboundChannelMarketing.com. A webcast presentation of the report will be held on March 10, 2016 at 1:00 PM Eastern / 10:00 AM Pacific. More information is available at http://www.StateofInboundChannelMarketing.com/webcast. Averetek is the largest provider of channel marketing automation software in the world with 239,000 users from 59,000 channel partner organizations in 195 countries. Averetek is the partner-led demand generation engine for leading brands like SAP, Google, Citrix, Splunk, FireEye, and Avalara. Averetek’s clients use the platform to enable their channel partners to plan and execute a variety of marketing campaign tactics through simple workflows that generate pipeline and revenue.